SK hynix, South Korea's No. 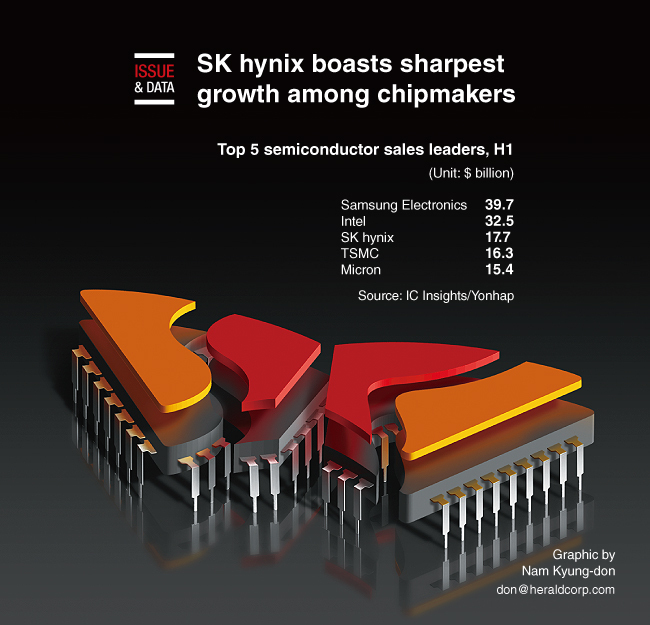 2 chipmaker, posted the sharpest growth in sales among the world's top 15 players in the first six months of 2018, industry data showed, with Samsung Electronics maintaining its solid lead. SK hynix saw its sales jump 56 percent on-year to reach $17.7 billion in the January-June period, the data compiled by IC Insights showed. Samsung Electronics topped the list by boasting a whopping $39.7 billion in sales, up 36 percent on-year, followed by Intel which advanced 13 percent over the cited period to reach $32.5 billion. Taiwan Semiconductor Manufacturing followed with $16.3 billion, and US-based Micron Technology with $15.4 billion.